I have had a love affair with these pillows since I bought them. First of all, the pillow covers (they are shipped from England, so you add your own pillow form) were not cheap, but I loved them enough to splurge. 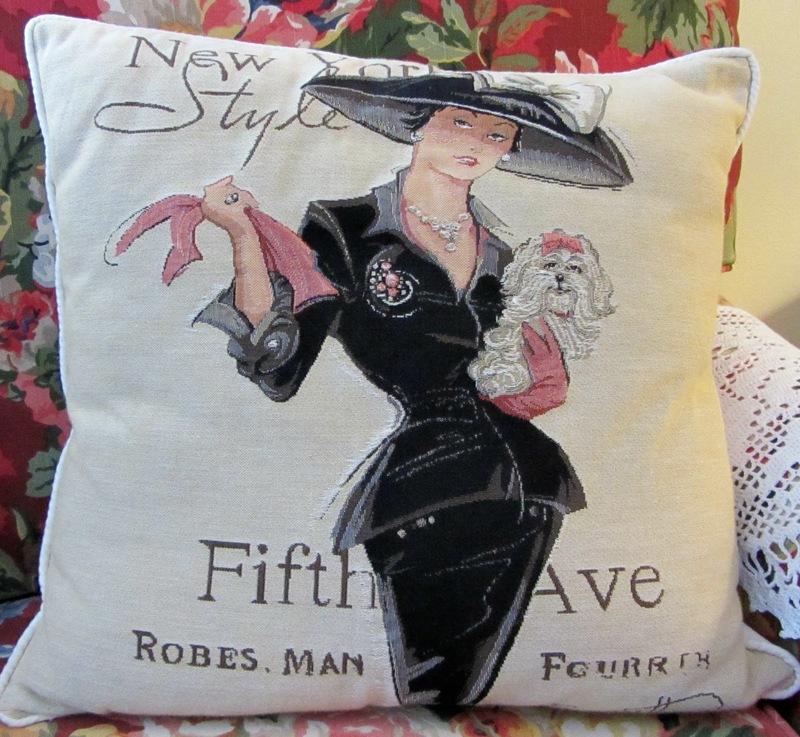 I first saw them on ebay but you can buy them online at www.designer-cushions.com. One of my sofas is a floral, linen material, slip-covered look, Flexsteel from 1998. The fabric and frame are still in marvelous condition. It was love at first sight with my sofa, and I'm not ready to let go of it yet! 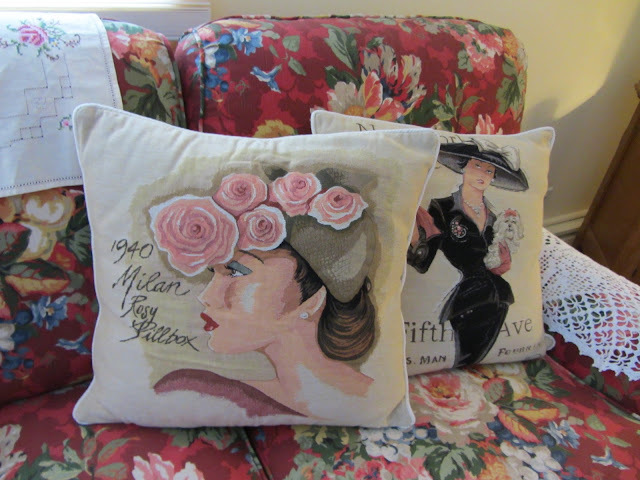 But, I can change up the attitude of "little old lady floral sofa" to "ooh la la" English or French Country style. I will show the entire sofa soon when I discuss my opinions about pattern, florals, plates, and antiques, and reveal my entire living room. Fun pillows AND a busy sofa (and I love it). 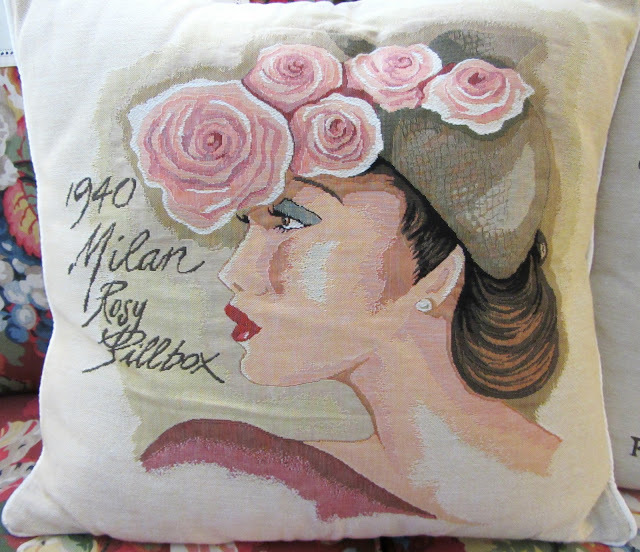 I hope you enjoyed a little pillow whimsy! What stunning pillows! I love them! And I LOVE your sofa, too! I love the fabric and would enjoy it for a long time too. I was just shopping for a new couch with my daughter and son-in-law last weekend and we looked at Flexsteel. They still make a great sofa. My son has my old set in his apartment. I'm having my first ever Choose Joy Giveaway at Cottage and Creek. Please stop by to enter and join in the fun. I think the background color is a wine red with some darker burgundy. Anyways it's not a true red. Thanks for your nice comment and I will check out your blog too. Thanks Alison. I will be back with more fun! I love your pillows and your sofa! I think they look fabulous together! 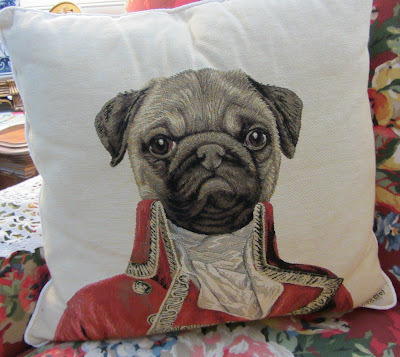 LOVE that pug pillow,that is my fav too! I just love your pillows.